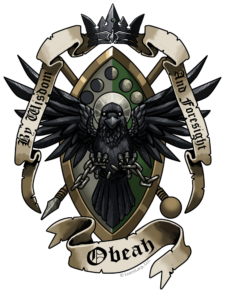 The crest for Dan Obeah features the house mascot, the raven, a wise and cunning magical familiar that is not to be underestimated. With colors of green and silver, Obeah is connected to the earth, to healing and renewal, and to the magical ores and elements that grow within it. The phases of the moon symbolize growth, change and transformation, both magical, as the founder is a shapeshifter, and throughout one’s life as one continues to incorporate new knowledge and become closer to one’s authentic self. The motto, By Wisdom and Foresight (Consilio et Prudentia) demonstrates the importance of knowledge and clear-thinking in all things, most especially in taking care of others and the environment. The shield shape and weapons evoke the African heritage of the house founder, a woman who elected never to reveal her actual name, but came to be known as “Tituba” based on a common disguise she used. A powerful wizard of Ashanti origin, the person we now know as Tituba journeyed to the Caribbean and South America before taking up residence in the Massachusetts Bay Colony, seeking to heal and teach magic. Tituba is a healer, midwife, shaman, and a Nagual, who transforms into a leopard or jaguar. She recognizes that healing sometimes means surgical excision, and that can mean removing a scourge from society by sometimes unorthodox means in order to achieve greater health for the community. Her expertise in botany, ritual, potion making, and the relationship between the spirit and physical world were sought after by the wizened from around the world, and more than once she has helped restore the essential energetic balance among beings. The raven holds a broken chain, both symbolizing freedom from the literal enslavement of Tituba and other people of African origin in the New World, and the freedom of the mind that wisdom brings. Members of Dan Obeah seek to break free of barriers and to use knowledge to transform the world. Many members of Dan Obeah (Dan is the Akan word for House, the first language spoken by Tituba) come from prominent families of wizard heritage from North Eastern North America, a province called Destiny. However, any mage can be accepted into Dan Obeah, and house members particularly seek out those with the shape-shifting ability, an interest in healing, and students with exceptional knowledge and skills who wish to use them for justice.